Reports of terrestrial radio’s death are greatly exaggerated. In spite of the advent of internet radio – and the hype that surrounds it – terrestrial radio is still in decent health. And radio is likely to remain healthy for some time to come. Advertising dollars tell the story – just as they’ve done since radio first arrived on the scene. Over the past ninety years, a constant parade of technologies has offered advertisers new ways to reach their audiences. Radio was the first to arrive. 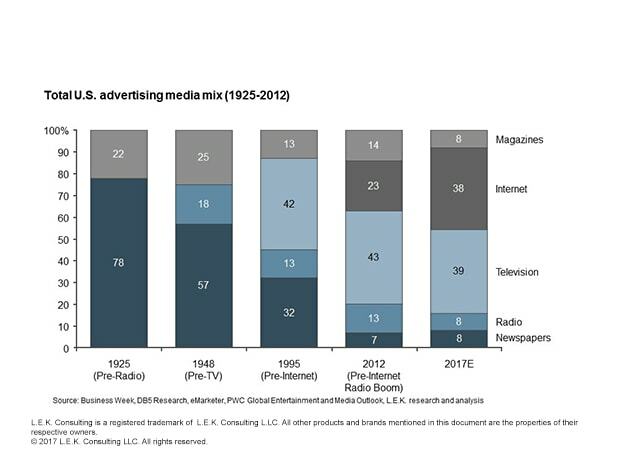 As TV and internet arrived, terrestrial radio saw its share of advertising spend decline, but not nearly to the extent that newspapers and magazines did. Radio managed to hold its own as magazine advertising declined dramatically and as newspaper advertising was devastated. 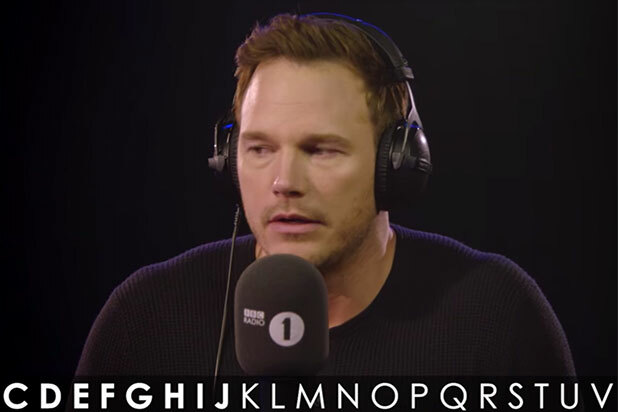 With all the new options, why is terrestrial radio still hanging on? Simply put, advertisers still see value in radio. Terrestrial radio offers a high “share of mind” relative to other advertising platforms. Equally as important, radio has widespread reach, targets captive listeners, and gives advertisers the ability to “contextualize” their messages, making them directly relevant and impactful in local markets. 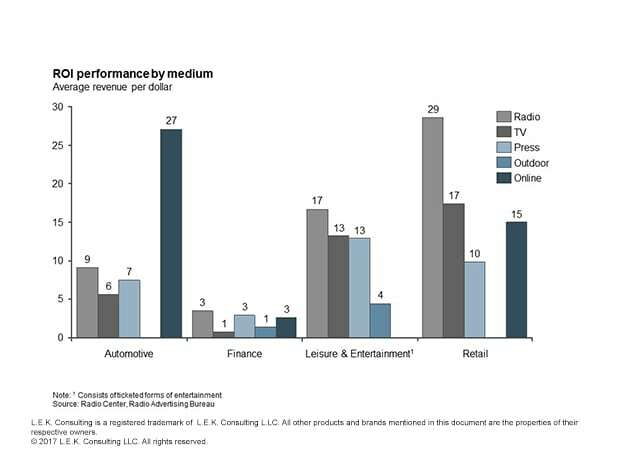 Radio, in certain categories, surprisingly leads the pack on return on investment (see graphic below). Especially for retailers (whose survival depends on their ability to connect locally), terrestrial radio is the best-performing of all advertising platforms. Of course, there is no question that internet radio has had a significant impact on terrestrial radio spend. Station owners have embraced new forms of advertising, including digital, in order to offset declines in on-air spot advertising and grow overall revenues. New digital-only platforms such as Spotify and Pandora have emerged as well. In next week’s post, we will explore the digital radio market in more detail and discuss what the future holds for this medium. This is part 1 in a series on radio by Dan Schechter and Gil Moran from L.E.K. Consulting’s Media & Entertainment practice.